Genestra Cal Mag Liquid is a great-tasting calcium-magnesium supplement that supports bone health, maintains normal Cal Mag Liquid 2 is a great-tasting calcium-magnesium supplement that supports bone health, maintains normal muscle function and neutralizes excess stomach acid. Calcium’s role in bone health is well-documented, and adequate calcium as part of a healthy diet, along with physical activity, may reduce the risk of developing osteoporosis. Magnesium also supports several key components of bone maintenance, improving bone mineralization by enhancing osteoblast and reducing osteoclast activity. In individuals with low magnesium status, magnesium intake improves bone mineralization during skeletal development, which could help maintain bone health later in life. Magnesium also helps to maintain proper muscle function, including the heart muscle, as well as normal electrolyte balance and the body's ability to metabolize nutrients. 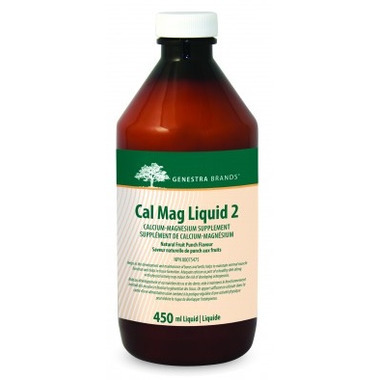 Cal Mag Liquid 2 provides calcium and magnesium in the form of calcium carbonate and magnesium hydroxide, which neutralize stomach pH as antacids. Specifically, they are used for the relief of heartburn, indigestion and upset stomach associated with excess stomach acid. As usual Genestra products are first class. Love the taste! !